З’ясовано лінгвокогнітивний механізм формування концептів ПОЗИТИВНЕ МИСЛЕННЯ і НЕГАТИВНЕ МИСЛЕННЯ як частини сучасного американського світобачення, встановлено метафоричні концептуальні моделі, які слугують форматом репрезентації позитивного і негативного стилів мислення в сучасній американській лінгвокультурі, та вербальні засоби їх вираження. Keywords: cognitive linguistics, concept, positive style of thinking, negative style of thinking, metaphorical conceptual model, analogical mapping, conceptual analysis. Background: Linguo-cognitive studies of concepts and linguistic means of their expression are a topical problem of modern linguistics due to the spread of interdisciplinary studies of language and cognition. Establishment of linguo-cognitive mechanisms of concepts formation reveals metaphorical conceptual models grounded in common human conceptual experience and embodied in linguistic units of different levels. Purpose: The purpose of the study is to determine the types of metaphorical conceptual models underlying the concepts of POSITIVE THINKING and NEGATIVE THINKING as part of modern American worldview. Results: The concepts of POSITIVE and NEGATIVE THINKING are bipolar formations consisting of the conceptual and verbal layers. The operation of analogical mapping is the linguo-cognitive mechanism of POSITIVE and NEGATIVE THINKING concepts formation realized through the projection of the conceptual implications of the source domain onto those of the target domain. The basic kinds of metaphorical conceptual models underlying POSITIVE and NEGATIVE THINKING concepts are conventional (ontological, structural, and orientational) and unconventional ones. Discussion: The language of positive psychology is an innovative field of research, which requires the study of different concepts underlying it. The analysis of POSITIVE AND NEGATIVE THINKING concepts, their theoretical understanding, and practical application involve the description of their structure, mechanisms of formation, and means of linguistic expression. Antonina Mosiichuk is Candidate of Philology, Associate Professor of the Faculty of English Philology at Vinnytsia State Pedagogical University named after Mykhailo Kotsyubyns’kyi. Her areas of research interests include cognitive linguistics, cognitive poetics, semiotics, and linguosynergetics. Ключові слова: когнітивна лінгвістика, концепт, позитивний стиль мислення, негативний стиль мислення, метафорична концептуальна модель,аналогове мапування, концептуальний аналіз. Along with classical psychology, which mostly targets mental disorders and personality pathologies, the field of practical or applied psychology is currently gaining in more popularity. Within the latter, there is a separate school of positive psychology, which primarily focuses on the ability of people to attain a positive mindset through changing their own thinking and behavior. Founded by M. Seligman (Seligman), a prominent American social psychologist, it has its own theoretical framework and practical application. The development of the approach has resulted in the emergence of a separate genre of popular psychological literature represented by the works of N. Peale (Peale), D. Carnegie (Carnegie and Carnegie), L. Hay (Hay), etc. Taking into account the undeniable connection of human thinking and language posited by cognitive linguistics (Lakoff, Johnson), the language of positive psychology has come into focus of linguo-cognitive studies, which are mostly aimed at analyzing the concepts underlying it. Present-day linguistic research has approached positive thinking as a concept in the unity of its ideological (Bordyuk), conceptual, and evaluative (Karpova) content as well as discourse (Kyrychuk). Notably, being a constituent part of culture, it has been analyzed as an important linguoconcept of modern American worldview (Karpova). This study focuses on metaphorical conceptual models underlying the formation of the concepts of POSITIVE THINKING and NEGATIVE THINKING as part of American worldview and linguistic means of their representation. The material of the research is the book of practising American psychologists, trainers, and coaches B. Tracy and Ch. Tracy Stein “Kiss That Frog: 12 Great Ways to Turn Negatives into Positives in Your Life and Work”. In the book, Brian Tracy and his daughter, therapist Christina Tracy Stein, who both specialize in personal growth and leadership skills, delve into a variety of effective techniques and strategies intended to change one’s mindset from negative thinking to positive thinking (Tracy, Tracy Stein 3). The object of this study is metaphorical conceptual models determining the formation of POSITIVE and NEGATIVE THINKING concepts as part of modern American worldview. The subject of the research is linguistic and cognitive characteristics of the linguistic units verbalizing the concepts under analysis. The aim of the article is to reveal metaphorical conceptual models underlying the concepts of POSITIVE THINKING and NEGATIVE THINKING in modern psychological literature. The fact that the study is conducted in the framework of cognitive linguistics predetermines topicality of the research enabling us to use the achievements of related scientific schools, cognitive psychology and cognitive poetics in particular (Freeman; Kovesces). The linguo-cognitive perspective of the article gives a possibility to establish the mechanisms of the formation of the POSITIVE THINKING and NEGATIVE THINKING concepts thereby disclosing their linguo-cognitive nature. The hypothesis of the research is the assumption that the concepts of POSITIVE THINKING and NEGATIVE THINKING are bipolar formations structured at the conceptual level by conceptual metaphors as the units of human conceptual experience and expressed in a verbal form through certain linguistic means. The former are activated in an individual while reading the books, listening to the lectures, or participating in psychological training dealing with the positive perception of reality. It is also supposed that appealing to the people’s subconscious and conscious levels of thinking, positive psychologists use a repertoire of linguistic units and structures, which reprogram the recipients’ models of negative thinking thereby substituting them by a set of different schemes forming a positive attitude. In the paper, the positive style of thinking refers to the optimistic and confident perception of objective reality which helps an individual to reach true happiness (Tracy, Tracy Stein 60) while the negative style of thinking is associated with a pessimistic life stance and restricted vision of the situation which prevents one from achieving well-being. This study hypothesizes that positive thinking and negative thinking are embodied in certain metaphorical conceptual models characteristic of them. The prerequisite of the formation of metaphorical conceptual models is the presence of two conceptual domains: the source domain and the target domain containing structured human knowledge and experience (Evans, Green 167; Lakoff 206-209). The source domain is organized by abstract structures of experience, which are conceptualized in terms of more concrete and understandable notions contained in the source domain (Dirven, Verspoor 34; Taylor 132-133). The projection of image-schemas grounded in common sensor-motor experience on the knowledge structures in the target domain is known as the operation of analogical mapping, which is based on the human cognitive ability for the analogical conceptualization of reality – i.e., revealing similarity between objects, abstract notions, and their characteristics (Freeman). Thus, in the sentence Your mind is like an extraordinary computer that you can preprogram to accomplish amazing things (Tracy, Tracy Stein 58) the lexical unit mind activates the corresponding concept MIND constituting the target domain while the lexical units computer and preprogram activate the concept COMPUTER. Through metaphorical projection of the conceptual implications of the concept COMPUTER – machine, programming – on the related conceptual implications of the concept MIND, one arrives at the metaphorical conceptual model MIND IS A COMPUTER that can be programmed. This way, the connotative meaning of the sentence is interpreted and understood in terms of the above-mentioned metaphorical conceptual model: human mind is a computer that can be preprogrammed by people to do amazing things (achieve their goals, unleash their potential, etc.). Hence, the methodology of the research is based on conceptual and interpretative analyses allowing us to determine metaphorical conceptual models that are embodied in the semantics of the lexical units (Strilchuk 8). It incorporates two stages: 1) the analysis of negatively and positively charged lexemes, which disclose conceptual implications indicative of NEGATIVE and POSITIVE THINKING concepts respectively; 2) analogical mapping of the conceptual implications of the source domain onto those of the target domain with the aim of revealing metaphorical conceptual models the analyzed concepts are grounded in. The title of B. Tracy and Ch. Tracy Stein’s book “Kiss That Frog: 12 Great Ways to Turn Negatives into Positives in Your Life and Work” contains an allusion referring the reader to a world-famous fairy-tale about a frog and a princess. The latter was unwilling to kiss the frog but finally overcame herself turning the frog into a young handsome prince who married her (Tracy, Tracy Stein 1-3). Notably, the authors use this metaphorical allusion not without a purpose as fairy-tales are widely employed in psychological counseling as a powerful instrument of psychoanalysis due to their ability to touch upon the depth of human subconsciousness. Overall, the ability of all levels of language to evoke images in the addressee’s consciousness is effectively utilized by psychologists. Among lexico-stylistic means, encompassing similes, euphemisms, hyperboles, allusions, and others, metaphorical formations with their immense potential take the leading part (Belova 5). Patients often employ metaphors while describing their personal problems thereby avoiding painful memories, topics, or taking responsibility for their life. Since metaphorical linguistic expressions are linked to metaphorical concepts in a systematic way (Lakoff, Johnson 7), they are analyzed in the paper to reveal the metaphorical conceptual models underlying the concepts of POSITIVE THINKING and NEGATIVE THINKING. In the course of conceptual analysis, it has been found out that NEGATIVE THINKING and POSITIVE THINKING are represented in the book by three types of conventional metaphorical models: ontological, structural, and orientational. Ontological metaphorical models are based on humans’ experience with physical objects, their own bodies, in particular, offering “ways of viewing events, activities, emotions, ideas, etc., as entities and substances” (Lakoff, Johnson 25). Thus, HUMAN MIND IS A PHYSICAL OBJECT metaphor allows to conceptualize THOUGHTS as OBJECTS THAT CAN BE EXCHANGED: exchange a positive thought for a negative thought (Tracy, Tracy Stein 68). Further, MENTAL ACTIVITY can be understood in terms of MOVEMENT. Consequently, NEGATIVE THINKING IS MOVEMENT BACK: remove all those fears, doubts, insecurities, negative emotions, and false beliefs that hold you back (Tracy, Tracy Stein 10) while POSITIVE THINKING IS MOVEMENT FORWARD: leap forward confidently (Tracy, Tracy Stein 83). From this standpoint, NEGATIVE MENTAL THOUGHTS are conceptualized as OBSTACLES that deter people from achieving their goals: the biggest obstacles that stand between you and an extraordinary life are usually negative mental attitudes toward yourself and others (Tracy, Tracy Stein 3). Another ontological metaphorical model embodying the concept NEGATIVE THINKING is NEGATIVITY IS WEIGHT: you must get rid of all the old baggage and negativity that holds you back, like leadweight (Tracy, Tracy Stein 103); you get rid of the baggage of the past and unleash your potential (Tracy, Tracy Stein 105). In the given examples, negative emotions are conceptualized in terms of weight or baggage that prevents people from moving forward and realizing their potential. On the contrary, POSITIVE THOUGHTS are understood as LIBERATION FROM RESTRICTIONS: You liberate your mind from the constraints of day-to-day work and bill paying. You practice what is called “blue sky thinking”, a hallmark of top people and peak performers in every area (Tracy, Tracy Stein 12). Thus, positively charged lexemes liberate and blue sky thinking are indicative of the conceptual implications of the POSITIVE THINKING concept – freedom, liberty. Structural metaphorical models help to further structure the experience delineated by ontological metaphors (Kovesces 39). Accordingly, the ontological metaphorical scheme MIND IS A PHYSICAL OBJECT is organized in terms of the model MIND IS A COMPUTER that can be programmed: The second and perhaps most powerful technique of mental programming is visualization. The more you feed your mind with clear mental pictures of the person you want to be and the results you want to achieve, the deeper these commands go into your subconscious mind (Tracy, Tracy Stein 61). Another metaphorical model MENTAL ACTIVITY IS PROCESS can be detailed through the structural metaphorical model MENTAL ACTIVITY IS BUILDING where POSITIVE EMOTIONS are conceptualized as BUILDING BLOCKS: The two most powerful positive emotion builders are the phrases “I like myself” and “I am responsible” (Tracy, Tracy Stein 93). Orientational metaphorical models are based on spatial relationships, such as UP – DOWN, FRONT – BACK, IN – OUT, FORWARD – BACKWARD, ON – OFF, CENTER – PERIPHERY, NEAR-FAR, grounded in human spatial experience (Lakoff 56-60; Taylor 134-135). The dominating orientational metaphorical model embodying NEGATIVE THINKING is NEGATIVE IS DOWN: preprogram and reprogram yourself to feel and act with confidence and self-control, especially under stress (Tracy, Tracy Stein 59). The analyzed example shows that negative emotions often accompanied by stress make people feel down with negativity overpowering them. Conversely, positive thinking is conceptualized in terms of the model: HAPPY THOUGHTS ARE UP, POSITIVE IS UP: happy, fulfilling, uplifting thoughts that lead to positive actions and results (Tracy, Tracy Stein 8); when you raise the self-esteem of another, your own self-esteem goes up in equal measure (Tracy, Tracy Stein 94). Along with conventional metaphors constituting the conceptual system of a culture, there are imaginative and creative metaphors “capable of giving us a new understanding of our experience. Thus, they can give new meaning to our pasts, to our daily activity and to what we know and believe” (Lakoff, Johnson 140). The analyzed illustrative material allowed us to reveal a number of powerful unconventional metaphors: NEGATIVE EMOTIONS ARE FROGS: five major factors cause people to create negative emotions and hold on to them. These are some of the worst frogs of all, swimming deep in the darkest waters of the emotional swamp (Tracy, Tracy Stein 39); …negative emotions alive by feeding them with thought and energy (Tracy, Tracy Stein 46). According to the authors, almost all people have a “frog” they need to “kiss” in order to become truly happy (Tracy, Tracy Stein 2) and transform their lives. Since kissing the frog is usually associated with something unpleasant or even disgusting, the authors use this image to refer to NEGATIVITY: All of us have a frog that we need to kiss, sometimes several frogs. The frogs in your life are negative people, situations, and past experiences; current problems; and your doubts and self-limiting beliefs. Some frogs are risks and commitments you have to make if you want to get unstuck and move ahead (Tracy, Tracy Stein 17); your job is to "kiss that frog" and find the positive elements that exist within every situation, to deliberately turn every negative into a positive, and to unleash (Tracy, Tracy Stein 10). Conceptual analysis of the negatively charged lexemes negative, problems, doubts, self-limiting, risks allows us to reveal the metaphorical model NEGATIVITY (NEGATIVE PEOPLE, SITUATIONS, EXPERIENCES, PROBLEMS, DOUBTS) IS A FROG that prevents people from realizing their potential and attaining their dreams. Further, there is a group of unconventional metaphorical models underlying the concepts MIND and THINKING. They are MIND IS A POND: He discovered that negative emotions, ugly frogs that squat in the back of your mental pond, are the primary obstacles to enjoying the happiness (Tracy, Tracy Stein 28); MIND IS A GARDEN, POSITIVE THOUGHTS ARE FLOWERS, NEGATIVE THOUGHTS ARE WEEDS: Your mind is like a garden: if you do not deliberately cultivate flowers, weeds will grow automatically without any effort on your part. If you do not deliberately plant and cultivate positive thoughts, negative thoughts will grow in their place (Tracy, Tracy Stein 8). In conclusion, the conducted research helped to identify analogical mapping as the main mechanism of the formation of POSITIVE THINKING and NEGATIVE THINKING concepts. The latter are grounded in two groups of metaphorical conceptual models: conventional (ontological, structural, and orientational) and unconventional ones. The results of the conceptual analysis demonstrate that the concept NEGATIVE THINKING has such conceptual implications as regress (MOVEMENT BACK), feeling restricted or limited (WEIGHT, OBSTACLES), being displeased or feeling disgusted (FROG). Conversely, POSITIVE THINKING can be characterized by such implications as growth, development, and progress (BUILDING, MOVEMENT FORWARD, UP) and feeling free (LIBERATION FROM RESTRICTIONS). On the verbal level, the above implications are correspondingly manifested through negatively and positively charged lexemes. Overall, the popularity of positive psychology testifies to the focus of society on the positive style of thinking as a characteristic feature of modern American worldview. Further research will be aimed at establishing the linguistic and cognitive mechanisms of the transition from a negative to a positive mindset through disclosing a set of corresponding conceptual schemes and the changes they undergo. This step will demonstrate the potential of metaphorical conceptual models as an effective tool for programming and reprogramming an individual’s outlook. Bordyuk, Larysa. “Ideolohichnyy Aspekt Kontseptu Pozytyvnoho Myslennya v Amerykans'kiy Linhvokul'turi (Ideological Aspect of the Positive Thinking Concept in American Linguoculture).” Naukovi Zapysky. Seriya “Filolohichna” 23 (2012): 16-17. Print. Carnegie, Dale, and Dorothy Carnegie. How to Enjoy Your Life and Your Job. New York: Callery Books, 2017. Print. Dirven, Rene, and Marjolijn Verspoor. Cognitive Exploration of Language and Linguistics. – Amsterdam, Philadelphia: John Benjamins Publishing Company, 1998. Print. Evans, Vyvyan, and Melanie Green. Cognitive Linguistics: An Introduction. Edinburgh: Edinburgh University Press, 2006. Print. Freeman, Margaret H. “Cognitive Mapping in Literary Analysis.” Style Fall (2002): 1–15. Web. 25 Feb. 2018. Hay, Louise, and Linda Carwin Tomchin. The Power Is Within You. Carlsbad, California: Hat House, Inc., 2009. Print. Il'nyts'ka, Lesya. Anhlomovnyy Suhestyvnyy Dyskurs (English-Language Suggestive Discourse). Diss. Taras Shevchenko National University of Kyiv, 2006. Web. 25 Feb. 2018. Karpova, Irina. “Linhvokul'turolohicheskii Kontsept "Pozitivnoe Myshlenie" v Rabotakh Amerykanskikh Sotsial'nykh Psikholohov (Linguocultural Concept “Positive Thinking” in the Works of American Social Psychologists).” Diss. Moscow Pedagogical State U, 2011. Abstract. Web. 25 Feb. 2018. Kovesces, Zoltan. Metaphor: A Practical Introduction. Oxford: Oxford University Press, 2002. Print. Kyrychuk, Larysa. “Kohnityvna Struktura Dyskursu Pozytyvnoho Myslennya (Cognitive Structure of the Positive Thinking Discourse).” Filolohichni Studiyi (Philological Studies) 4 (2004):149-155. Print. Lakoff, George, and Mark Johnson. Metaphors We Live By. London: The University of Chicago Press, 2003. Print. Lakoff, George. The Contemporary Theory of Metaphor. – Cambridge: Cambridge University Press, 1993. Print. Peale, V. Norman. The Power of Positive Thinking. New York: Touchstone/Simon&Schuster, 2015. Print. Seligman, Martin. Flourish: A Visionary New Understanding of Happiness and Well-being. New York: Free Press, 2011. Print. Strilchuk, Antonina. Syntaksychna Orhanizatsiya Tekstiv Suchasnoyi Amerykans'koyi Poeziyi: Linhvokohnityvnyy ta Synerhetychnyy Aspekty (Syntactic Organization of Contemporary American Poetry Texts: Cognitive, Semiotic and Synergetic Aspects). Diss. 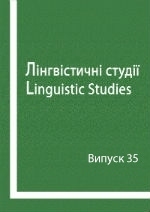 Kyiv National Linguistic U, 2009. Print. Taylor, John R. Linguistic Categorization: Prototypes in Linguistic Theory. London, New York: Routledge, 1995. Print. Tracy, Brian, and Christina Tracy Stein. Kiss That Frog: 12 Great Ways to Turn Negatives into Positives in Your Life and Work. San Francisco: Berrett-Koehler Publishers, 2012. Print. Надійшла до редакції 13 березня 2018 року.